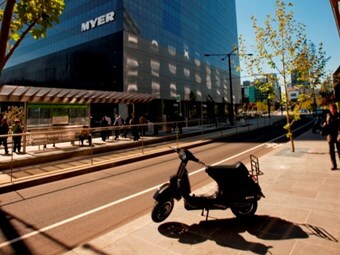 The Australian Government has recognised the future transport role of motorcycles and scooters to reduce growing road congestion. Speaking at Australia’s Parliament House yesterday, Federal Transport Minister Anthony Albanese described two-wheeled vehicles as space-efficient, fuel-efficient, and useful in reducing road congestion. Although not mentioned explicitly by Albanese, the benefits for commercial and public road transport are obvious: two-wheeled vehicles leave more room for road freight and passenger services to move freely. "Some recent European studies suggest truly extraordinary improvements in congestion through a greater reliance on motorcycles," Albanese says. "They have less embodied energy, only about a fifth of that involved in producing the rubber and steel and various parts that make up a car." "Compared to the car, they also cause much less damage to roads – not to mention lower emissions." Facing growing road congestion, Australian residents have been turning to more effective transport modes in record numbers and, according to Albanese, motorcycle and scooter registrations are the fastest growing road vehicle sector. "Twenty years ago, dealers in Australia were lucky to move 700 scooters in a year – these days they sell a 1,000 a month," Albanese says. "And light-weight commuter bikes are usually the best sellers among motorcycles." Albanese says the surge in demand is forcing a major shift in the way government looks at bikes and scooters. "A lot more people, including those responsible for transport policy, are now taking seriously the role motorcycles can play in transport, especially urban transport," Albanese says. Concluding his speech, Albanese hinted at the need for more motorcycle and scooter regulation and standards as the modes play a larger role in the Australian transport system. Meanwhile, in countries such as China, which has some of the worst congestion and pollution problems in the world, motorcycle and scooter companies such as Vmoto have been rapidly expanding their supply chains in response to growing consumer demand. Vmoto today announced to the Australian Securities Exchange (ASX) it had opened its first flagship retail store in China’s Lishui District, Nanjing. Vmoto specializes in ‘green’ electric powered two-wheeled vehicles, a rapidly growing transport market in China. The company’s announcement follows its recent launch of six new electric, two-wheeled models in China, with the company expecting to sell more than 10,000 of the models by 2013. In the past ten years, China has been the largest growing two-wheeled vehicle market in the world, making up the majority of global electric two-wheeled vehicle sales, according to Vmoto. In 2012, annual sales of electric vehicles reached 30 million units. The 2012-2015 China Electric Vehicle Industry Report, published November 2012, predicts annual sales will increase to 40 million units in 2015. It’s not surprising when you consider it’s estimated up to 300 million of China’s 1.4 billion people will move from the countryside by 2030 to join about 600 million people now living in cities. In April, Vmoto also announced it would enter the Brazilian market, the world’s second largest scooter market. Through a Joint Venture (JV) with Riba Motos Industria e Comercio (Riba), Vmoto will have direct access to an assembly facility with distribution to Latin America. By entering into the JV, Vmoto expects to be the first electric scooter company to supply to fleet customers in Brazil. According to the company, no major electric two-wheeled manufacturer is yet present in Brazil. But due to Brazil’s efforts to protect its domestic motorcycle industry, the import tariffs on fully-assembled units make imports prohibitively expensive. A company statement says it is therefore essential to establish a local assembly plant with a local partner. Parts sent in complete knock down (CKD) format from outside Brazil incur customs fees of about 100 percent. "In addition, Brazil does not currently have a domestic electric vehicle industry and therefore the supply chain and expertise must come from outside the country," the statement says. "A manufacturer cannot also be a distributor and so it is doubly essential to have a strong local partner." The Brazilian Postal Service (Correios) has been trialling 14 of Vmoto’s electric delivery scooters across five of its city operations. Correios is one of the largest state-owned companies in Latin America and is responsible for the national postal service of Brazil. It delivers to 50 million households across the country and Riba is negotiating with Correios to supply electric scooters to them to replace their existing petrol delivery fleet. Correios has reportedly declared that at least 50 percent of their 14,000 petrol motorbikes will be replaced with electric scooters by 2017.